One of my favorite things to collect are old wooden chairs. The more character that they possess the better! Most of the time, though, these distinguished looking chairs require just a little bit of a makeover. Like anything that has been around for a long time, the charm and warmth that exudes from age can be enhanced to fit right in with the hip younger crowd! Usually all it takes is some updating of the colors and fabric choices. When I first acquired this now black chair, it was attired in a dated shade of green and flaky paint and it’s seat was covered with a busy floral. It looked like it was straight from grandma’s garden so it needed a pretty good makeover. Changing it’s color to a chic black with a little distressing, to maintain it’s character, allowed it to fit seamlessly with the more modern rustic decor in the rest of the house. Dressing the seat in a new updated fabric also lended to a more sophisticated style. I had another chair that was better off serving a whole new purpose. The original cane seat was missing so instead or repairing it, I transformed it into a very whimsical and fun holder for magazines in my office. I added all kinds of unusual embellishments to make this new “magazine holder” artsy and interesting. You can check out the chair before the makeover by clicking on the photo. I searched for some more examples of chair makeovers, that I thought were inspiring, to share with you from around the web. Just click on the photos to see the before pictures and process. 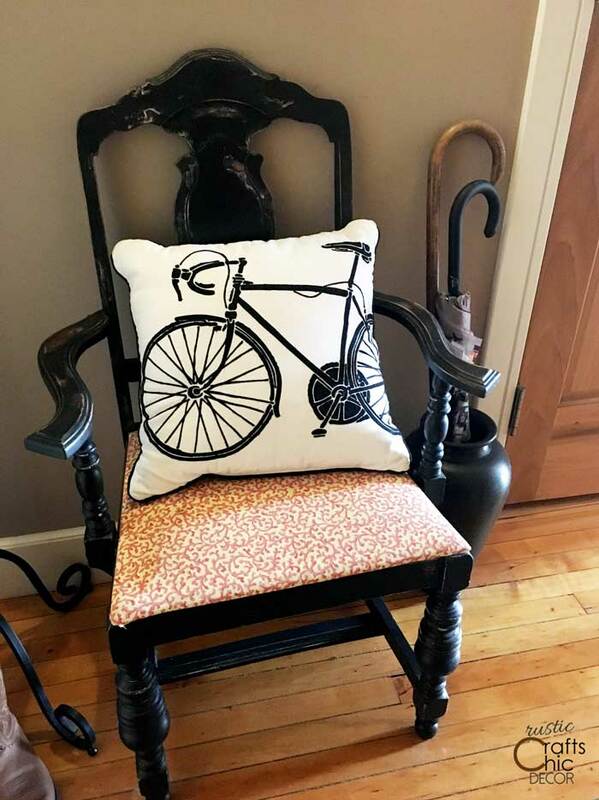 Chair makeover by Jessica Jones Designs. 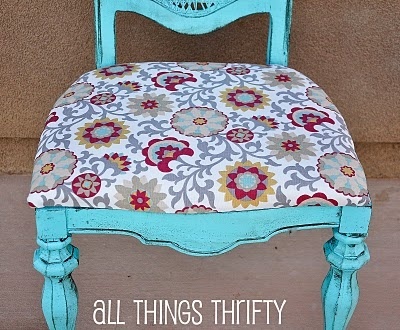 This chair went from dull and dungy to bright and cheery! I love the fabric choice with the white paint. 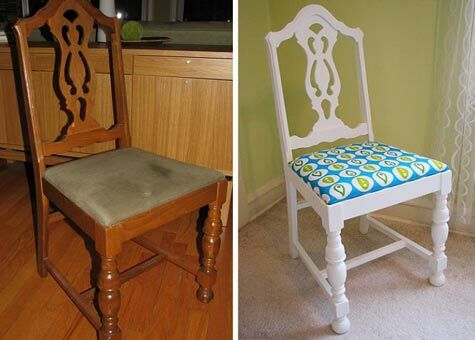 A beautiful chair transformation by All Things Thrifty. 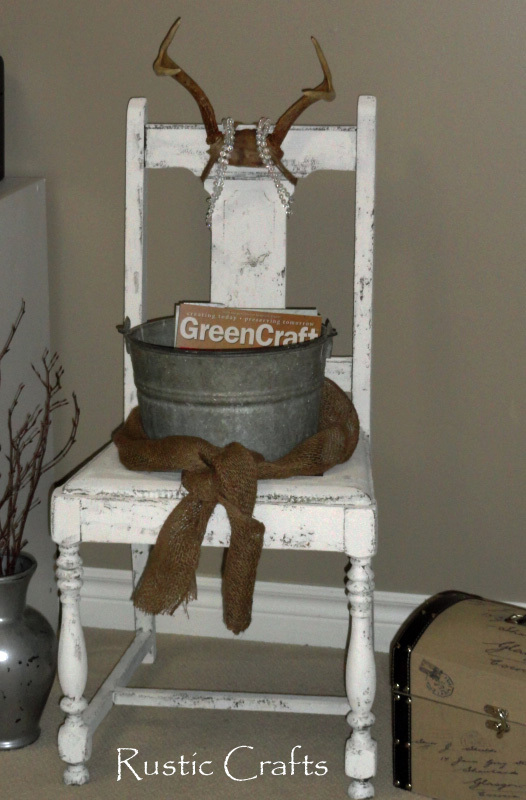 It pays to pick up old chairs from yard sales when you can turn them into something wonderful like this! 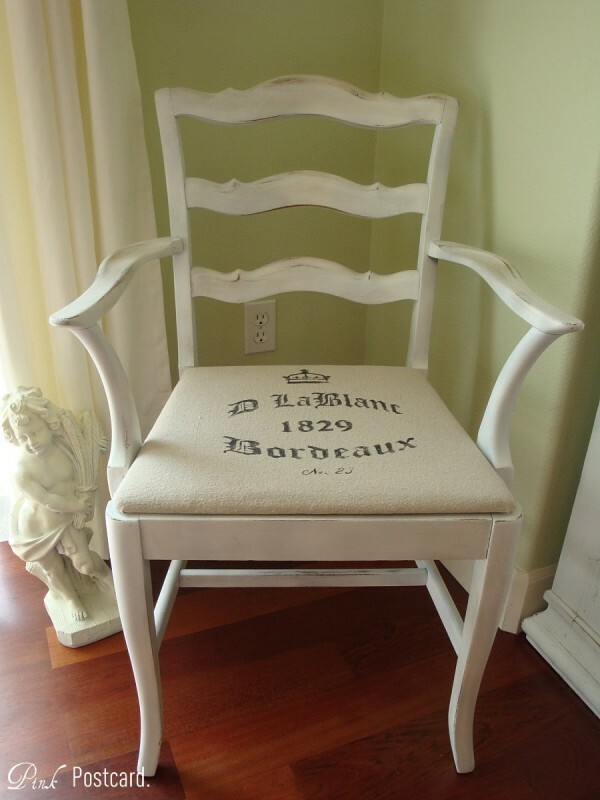 French inspired chair makeover by Pink Postcard. I love French inspired furniture and this transformed chair is especially chic. I love all of the chairs.